Yen Bai (VNA) – Deputy Prime Minister Trinh Dinh Dung directed flood recovery efforts in Mu Cang Chai district, the northern mountainous province of Yen Bai on August 3. He urged local authorities to promptly seek missing people and providing support for victims and their families. With the support of Military Zone 2, the Ministry of Agriculture and Rural Development (MARD), the Ministry of Natural Resources and Environment (MoNRE) and relevant ministries and agencies, localities must evacuate residents to safety areas and provide them with necessities. The Deputy PM asked the locality to soon repair roads, houses, schools, hospitals and key public works, ensure communications and normal production. The MoNRE and MARD were required to promptly zone off landslide-prone areas to minimise losses. Preliminary statistics showed that the disaster left two dead, 13 missing and 8 others injured in the district. The total damage in Yen Bai is estimated at nearly 150 billion VND (6.52 million USD). 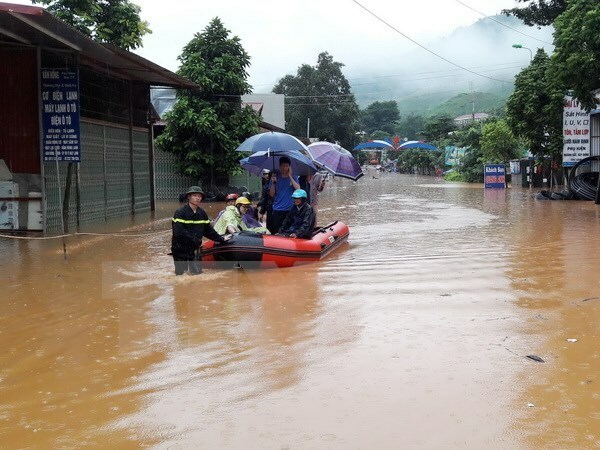 Earlier on August 2, the heaviest rainfall and flash flood hit Muong La district, the northern mountainous province of Son La, leaving 6 dead, three injured and 10 others missing. Vice Chairman of the provincial People’s Committee Lo Minh Hung, who is also deputy head of the provincial Steering Committee on Disaster Prevention and Control and Search and Rescue, asked local authorities to evacuate local residents and their assets out of landslide-prone areas while seeking the missing people and providing support for victims’ families. The flooding swept away 188 houses, destroyed 119ha of rice, 20ha of corn, nearly 800 heads of fowl and cattle, and many other facilities.